=►Wash and boil the lemon along with 3 cups of water and salt (5-8min). =►Once the lemon is softened, remove boiled lemon from water. =►Allow it to cool for 30min. Wipe it with a towel to remove any water content. Then cut it into 8 pieces. =►Take a vessel add 2tsp of chilly powder, 1/4tsp of turmeric powder and lemon juice. =►Next add cut lemon pieces into it and marinate, keep it aside for 20min. 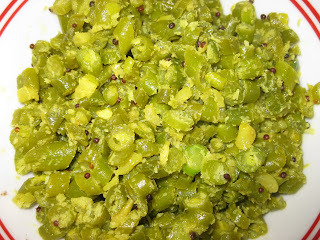 =►Heat oil in a pan add mustard seeds and allow it to splutter. 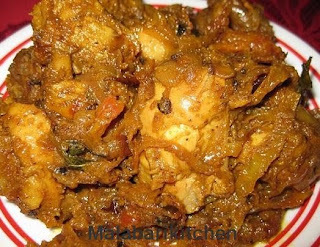 =►Add curry leaves, dry red chilies, sliced ginger, garlic, green chilies & hing. =►Sauté it to 2-3min and switch off the flame. 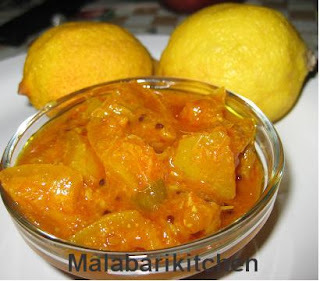 =►Next add this mixture into above marinated lemon mix. =►Keep it in refrigerator and use this after 7 days. Note: - Make sure that your hands are safe from water. Add vinegar or increase lemon juice quantity to make it more liquidy.